Brian Roberts Law Firm > What is a Breath Test? An Illinois breath test is performed on most people who have been arrested for an Illinois DUI and who are not injured. If you have been injured and require treatment at the hospital you will normally be given an Illinois DUI blood test rather than a breath test. 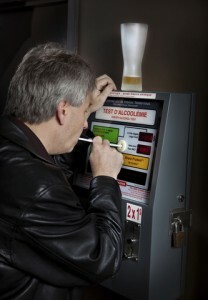 There are a number of ways to challenge an Illinois DUI breath test. There are three main types of defenses to an Illinois breath test. Each of these types of defenses can be combined with other defenses, while some may stand on their own. Choosing the best defenses to an Illinois breath test depends on a number of factors. Before we try your case to a judge or jury we will discuss these defenses with you and explain how we will use them in your case. The Illinois breath machines have a number of variances that can cause them to provide inaccurate breath alcohol results. That is why the State of Illinois requires police departments to verify the calibration of these machines on a regular basis. If they fail to do so, the breath results should not be admitted in court. Because of the variances that occur in these breath machines it is important that every aspect of the machine is carefully evaluated. A number of these machines can have voltage irregularities that may not be detected during the normal maintenance of the machine. It is only after careful evaluation that these irregularities will be detected. When the voltage of the machine varies, even slightly, the machine will give inaccurate breath alcohol results. There are a number of things the breath testing officer can do wrong that could cause the breath machine results to be excluded as evidence against you. If the officer failed to read you the Implied Consent law, failed to allow you time to contact an attorney after you requested one, or failed to follow the proper procedures in using the breath alcohol machine, the results of the breath test should be excluded. There are numerous medical conditions that can cause your breath test results to be unreliable. People with GERD and other reflux or stomach problems may hold alcohol in their stomachs for extraordinarily long time periods. This alcohol will then be expelled as you hiccup, burp, or otherwise expel air. Since this alcohol has not entered your bloodstream, it could not affect your blood alcohol content. The breath machines will, however read this as your BAC, and provide a falsely high BAC reading. If you were arrested for an IL DUI and took an Illinois breath test you should call us right now to learn how we can help you fight these charges. You only have a limited time to fight the Illinois DUI license suspension. Call us right now!